A new poll released by CNN on Tuesday found that 54 percent of non-college educated whites had a favorable opinion of Trump. Meanwhile, only a fraction felt the same way about two of the Democratic Party's leading contenders, Vermont senator Bernie Sanders and former Texas congressman Beto O’Rourke. The results indicate a favorability rating of 40 percent for Sanders and 20 percent for O'Rourke within this key demographic. Of the three, Trump was also the only one with an unfavorable rating (42 percent) that didn't overshadow his favorable number, unlike Sanders (52 percent) and O’Rourke (34 percent). 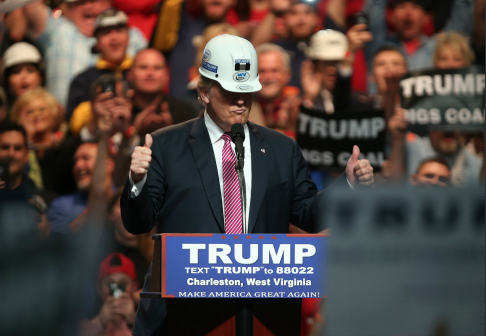 The poll's results bode well for Trump, who won the presidency in part because of his strength among white working-class voters in the industrial Midwest. In 2016, voters without a college degree backed Trump over former secretary of state Hillary Clinton by a margin of 52 percent to 44 percent. The share was significantly larger among non-college educated whites who broke for Trump by the largest margin since 1980—67 percent to 28 percent. "I think that there needs to be a profound change in the way the Democratic Party does business," Sanders said at the time. "It is not good enough to have a liberal elite. I come from the white working class, and I am deeply humiliated that the Democratic Party cannot talk to where I came from." CNN's poll reinforces trends on record since 1970 showing fewer and fewer working-class voters affiliate themselves with the Democratic Party. This entry was posted in Politics and tagged 2020 Election, Bernie Sanders, Beto O'Rourke, CNN, Donald Trump. Bookmark the permalink.